Our Pastor James M. Shea, SJ welcomes you to our vibrant and growing church. Ever since 1986 when the Bishop of the Diocese of Charlotte asked the Maryland Province of the Society of Jesus (the Jesuits) to administer and serve this parish, the people of St. Peter have engaged in a faith that does justice through our Ignatian spirituality. The Jesuit presence throughout this region is felt through the compassion of healing hearts, as Pope Francis calls us to be when he says, “I see the Church as a field hospital after battle…healing wounds.” The Ignatian spirituality at St. Peter provides opportunities for retreats into a deeper relationship with Christ and a discernment of seeing God in everything. St. Peter is blessed to have three Jesuit priests serving our parish in pastoral care and inspiring merciful outreach to those living on the fringes of society: Fr. Jim Shea, SJ, Pastor, Fr. 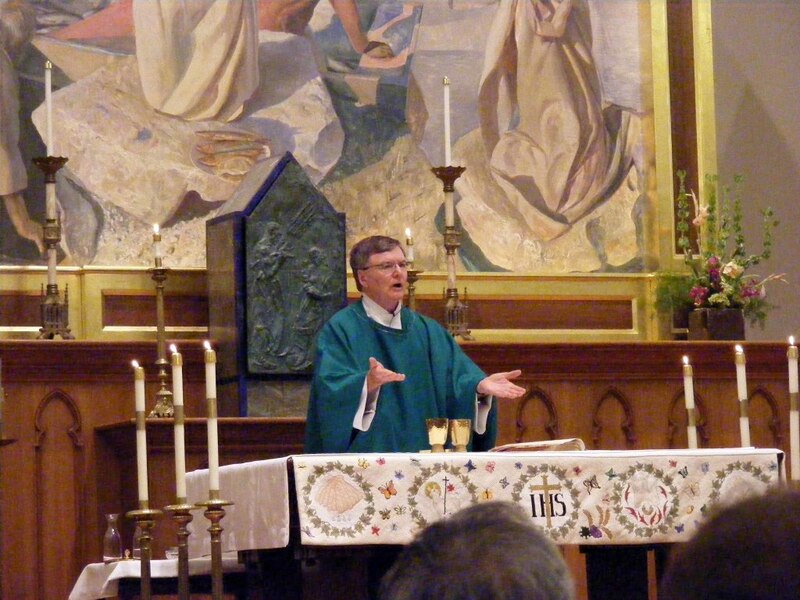 John Michalowski, SJ, Parochial Vicar and Fr. Jim Bowler, SJ, Pastoral Minister. The people of St. Peter are strongly committed to the poor. You will see this reflected in many pieces of our artwork. The parish outreach extends to migrants and refugees starting new lives in our city. As a church in the center of the city, we serve all people who enter our doors. Since its rebirth in 1986, the parish has grown to over 1,400 registered households. The church transformed in the mid 1980’s; the Jesuit priests brought vitality to the liturgy and inspired members to live their faith doing justice. St. Peter became an authentic parish again. As the city of Charlotte began its extensive growth, the Jesuit priests established strong ties to the uptown business community – serving pastorally and in the strategic development of social justice church ministries. To this day, St. Peter volunteers reach out to help the marginalized in our community. Parish outreach programs focus on concerns for refugee resettlement, shelter and affordable housing, youth education & career opportunities and race relations. As our pastor Fr. Shea notes, “St. Ignatius would be happy that we are in the Center City, as a missionary church going forth to serve.” We are a discerning people; listening to where we are called to act in mercy and encourage others. We welcome all to share in the joy of the Gospel and to come to know and taste God’s love. When several hundred Charlotteans, half of whom were not Catholics, watched the Rev. J.J. O’Connel lay the cornerstone for the original Saint Peter’s Catholic Church in 1851, they saw the cornerstone of Catholicism in Charlotte put into place. Benedictine monks were among those early ‘rocks’ at St. Peter’s. In 1892 the Rev. Francis Meyer, OSB, became pastor. He was the first of six Benedictine monks to serve St. Peter. The original building stood for 41 years before it became structurally unsafe. A munitions explosion at the close of the Civil War had damaged the foundation. In 1893 the cornerstone was laid for the building that now stands at the corner of South Tryon and First Street. First Street has since been renamed to “Levine Avenue of the Arts”. An early benefactor of St Peter was Saint Katharine Drexel of Philadelphia. She founded Sisters of the Blessed Sacrament for Black and Native American peoples. Her gift of pews to the parish was contingent on a promise that they would be reserved for the “colored” people, in fulfillment of her order’s mission. When the church was constructed it was at the extreme southern limits of Charlotte. As the city grew around St. Peter, the character of the neighborhood changed. Empty lots sprouted with homes. Later, homes were replaced with businesses. The church was soon at the heart of the city. In recent years, steel and glass skyscrapers have begun to tower over the slender Victorian steeple. The Catholic population of Charlotte grew with the city, particularly in the suburbs. New parishes were established to serve the growing community. Urban St. Peter gradually found itself with fewer and fewer parishioners. Though Masses were said, in 1970 the day-to-day activities of a parish stopped. In 1986 all that began to change. Today St. Peter’s congregation is a mixture of old and young, native Charlotteans and the newly settled, black and white, rich and poor, conservative and liberal, white collar and blue collar people. These people have banded together to make the church a small oasis of quiet serenity and beauty in the heart of Charlotte’s uptown business district. Changes began when a Victorian garden was planted on Tryon Street in front of the old rectory. Parishioner Ann McKenna,along with her sister and brothers, commissioned the garden as a memorial to their parents. This small garden was only the beginning. The next project was the church itself. 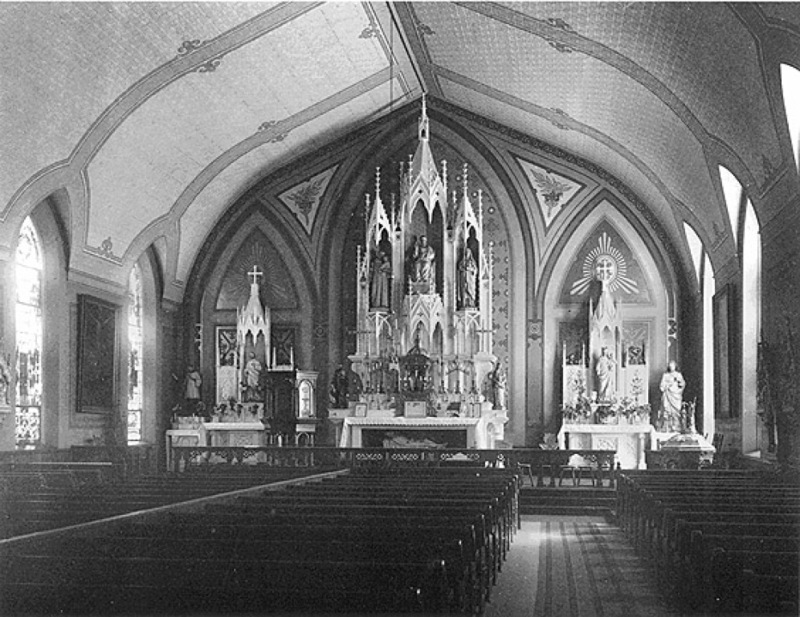 There had been many changes to the interior of the church over the years. Everything from the crown molding, to the pew, to the ornate plaster stations of the cross had been painted in a rainbow of hues. Architect Hastings and interior designer Anne Geary of Geary Designs collaborated on a plan for the restoration of the historic building. They worked closely with the St. Peter historic society, who guided the restoration. They assembled the team of professionals who would bring the old building back to its former glory. Charles R. Carmichael was retained as general contractor. “The interior has been restored with a simple and warm use of natural wood window casings and beaded board wainscoting,” Hastings said. “The delightful balcony railing with its delicate Moorish arch design and the crown mold of grape vine motif has also been restored to their natural heart pine finish. Artist Paul Sires modified and refinished the Stations of the Cross. The altar and the lectern tables were fashioned by Michael McSwain. Oliver Thompson, who made the processional cross, coordinated the stripping and reinstalling of the pews with a crew composed of many parishioners. Richard Karnia has constructed the tabernacle designed by Hastings. Paul Ehrenberg, former Facilities Manager, built the baptismal font. The 35 by 44 foot blank wall at the rear of the sanctuary could have been seen as a problem in the restoration, but to the historical society, it was an opportunity. The result was a triptych, or three-part fresco. It depicted Christ’s “Agony in the Garden,” “Resurrection,” and “Pentecost” the visitation of the Holy Spirit on the Apostles. Artist Ben Long agreed. “For the true believer, it must provide a glimpse of the divine.” The fresco at St. Peter was Long’s fifth. He was assisted in his work in Charlotte by Charles Kapsner, Laura Buxton, Anthony Panzera, Joshua Rosen, Roger Nelson and Tony Griffin. St. Peter was rededicated in 1989 after the renovation, restoration and completion of the fresco. In February of 2002, a third of the fresco’s center fell to the floor in millions of pieces. Parts of the fresco remained attached to the wall, and some parts loosely hanging. The skillful process of removing these remaining portions took months, but the church was able to frame these pieces of the original fresco and display them in campus buildings. New artwork was installed in 2007 and these include the altar triptych painting and bas reliefs on each side of the back wall. For a comprehensive guide to the history and artwork of St. Peter Catholic Church, please select this link History of St Peter, Church Art.